Secondary color palettes are complementary to official colors, but are not recognizable identifiers for Cal Poly and should be used in a supporting manner. Cal Poly marks may not appear in these colors. These palettes were designed with input from campus partners in an effort to provide a more flexible and robust range of colors for use in publications and collateral material. 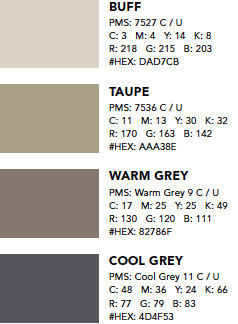 The Pantone (PMS) colors should be used when budget allows for the option to specify Pantone ink. 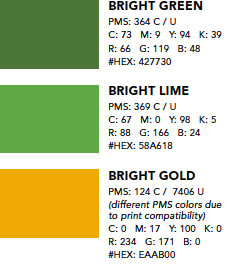 Otherwise, the four-color (CMYK) values listed should be used. Note: It is necessary to create these CMYK and RGB values listed within a document rather than relying upon default conversions. →Click here for validation tools available. 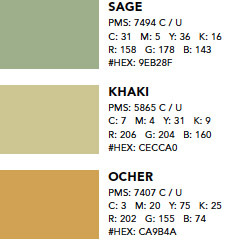 →Click here to download an Adobe Swatch Exchange file (.ase) of Cal Poly’s colors.